a tweet here and there (which was, on the whole, quite lovely as well). and it’s only twice a week, but still! darned kid seems to know. wreak havoc on the schools crayons instead. calm, elegant, involved but not too involved, on-the-ball but laid back mum? just combined. Do not over mix. and cook until the other side is golden as well. snack (or “baon” as we call it here). would think fairly typical for all other more experienced mums out there. Some very dramatic “tragic face” looks. Shy moments. Nutella makes everything better! If only I knew about that when I was starting school. I probably would've been a happier child growing up. haha! Oh goodness, these look delicious!!!! Can't wait to try these for breakfast! We always have table bananas delivered (for sale or free) at home and sometimes I need ideas on how to prepare them differently so they won't rot. You see I don't like eating them as is. Thank you for the idea. PS. I have been thinking of thanking you for introducing Pinterest in your blog (last year I think) I joined and I'm loving it. These banana pancakes look so amazing. How can something that looks this delish be so healthy? Thanks for sharing, Joey! absolutely yummy! my kids will be over the moon and back with these pancakes! and yes sir-ee, i do have whole wheat flour in my pantry! Hi Tin! Thank you 🙂 Just doing my part in preaching the gospel of breakfast! Hi Tracey! Yes! She took the pancake plain, but I was eventually able to able to get her to try a bite with Nutella which she, of course, liked! The okra however (that I mentioned in the same tweet) she asked for of her own volition and then proceeded to eat one after the other! Hi Catherine! Aside from these pancakes I have a bunch on banana bread and banana cupcake recipes here, just do a search 🙂 I placed some links as well on this post. Enjoy! Hi Jen! Just make sure you use whole wheat pastry flour (which is finer that regular whole wheat flour)…hope you kids enjoy this! This would be a treat for a morning breakfast. Especially a weekend for us. Those pancakes look super delish, and the Nutella dripping down makes me want to dip my finger in it! I was just about to ask if little C tasted the Nutella (since it's brown), but I saw your reply already. So was that her first-ever taste of chocolate? Not a bad way to start! 🙂 What was her reaction? Once again, you successfully made my stomach growl before I got to the end of the post… Cheers! Hahaha! Glad to hear that little C's first day turned out well. Now I'm curious about that Mr. Sun song! O so cute Jo! Haha. I can almost see you standing in front of her closet ( I would have gone for the wonder woman outfit..;). Pretty pancakes too! Hi Katrina! Yes, her first ever taste! And I had to semi -force her! Well, she, or course, liked it and asked for more bites 🙂 Although I have to say her reaction to my truffle scrambled eggs was more fervent 😉 She also had her 2nd taste of chocolate last night – chocolate soufflé at Chef Jessie’s. I had to tell her it was oatmeal so she would take the first bite! Hi Wine Wanderer! Haha! I have to say that I definitely fell victim to these!! Hi Simone! She will definitely be wearing the Wonder Woman t-shirt very soon! I am sure Little C. is going to have a blast at school! Congratulations to her! 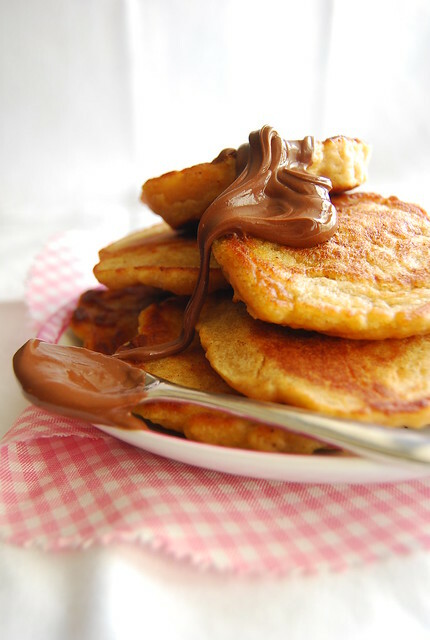 These pancakes look super delicious and I love it that you served them with Nutella – yum! A little kid who loves truffles at first bite — truly a girl after my own heart! 😀 I'm relieved she's slooowly warming up to chocolate. But maybe she just doesn't have very much of a sweet tooth? NOT a bad thing, especially with children. I'm still in awe that she liked okra — I can't stand the stuff! With the Nutella on top, I'm thinking these flapjacks would be nicer as merienda – with an additional scoop of dark chocolate ice cream! I love the agonizing decisions one must make for school. I also LOVE pancakes. So delicious! but i promise to make these whole wheat pancakes that looks so delicious. Hi Katrina! I didn’t really eat okra until recently! And I wasn’t trying to feed her any – we were having it and she wanted to try some…and liked it! I guess it’s true what they say that if you want your kids to eat their vegetables you have to eat them yourself first! Hi Redmenace! Right? 😉 I am getting a kick out of these little decisions because it distracts me from the tuition!! Hi Heidi! Ah, so you know where I’m coming from! 😉 Hope you enjoy the pancakes! I literally had to wipe off my drool with that picture! I am now hungry for pancakes, and it's all your fault! Hahaha! Definetly love these pancakes! Anything that incorporates whole wheat flour is a favorite of mine too! So delicious! omg..they look heavenlyyyy…i love this n nutellla is my guilt food.. These pancakes look fantastic. I like the idea with Nutella instead of syrup. I'll try this recipe next weekend. I'm sure my kids are going to love it.